What Are Some Recipes That Use Fresh Beets? 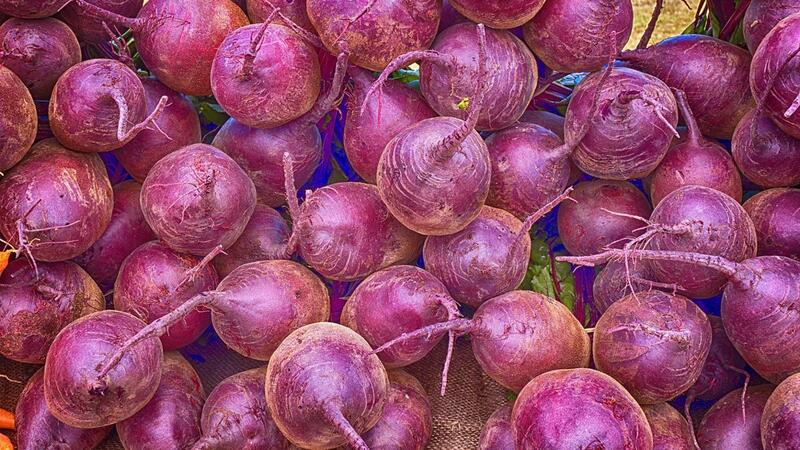 German beets and fresh beet horseradish are two recipes that use fresh beets. Both recipes call for boiling the beets to improve their texture and flavor. To make German beets, trim the tops of 10 medium beets to 1 inch. Bring to a boil 9 cups of water, 1 tablespoon of white vinegar and salt to taste. Add the beets and boil them for 40 to 50 minutes. Drain the beets, cool, peel and slice them. In a saucepan, combine 2 tablespoons of cornstarch, 2 tablespoons of sugar, 1 teaspoon of salt and 1/8 teaspoon pepper. Slowly stir in 1 1/3 cups of water and 1/2 cup white vinegar. Boil for one minute, stirring constantly. Add the beets and cook until hot. To make fresh beet horseradish, scrub 2 medium beets and trim their tops to 1/2 inch. Boil the beets for 30 to 40 minutes and then drain and set them aside to cool. Grate 1 4-ounce peeled horseradish using the smallest holes of a box grater. Combine the horseradish with 1/4 cup of cider vinegar, 2 teaspoons of salt and 1 teaspoon sugar. Peel and grate the beets using the smallest holes of a box grater. Mix the beets with the horseradish mixture and refrigerate. Where Can You Find Easy Recipes Online for Horseradish? What Are Some Recipes That Use Baked Spinach? What Is the Recipe for Baked Root Vegetables From the Kelly & Michael Show? How Do You Pickle Beets? Where Can One Find a Recipe for Golden Roasted Beets? At What Temperature Does One Roast Beets in the Oven? What Is a Quick Pickled Beets Recipe?